Computerized Uniform CPA Exam Tutorial – This tutorial helps you to be prepared for the computerized exam. It is strongly recommended that you go through this tutorial before sitting for the CPA exam. It also has practice questions to better help you understand the process. Jan Hess Sarbanes-Oxley Act Presentation – CFO of Teledyne Brown Engineering, Inc.
City of Birmingham Finance Dept. Alabama State Board of Accountancy: Rules, Laws, CPA Exam Requirements, etc. Monster.com – search worldwide jobs, personalize career tools, and find employees. America’s Job Bank- searchable database of employment opportunities, created through a partnership between the U.S. Department of Labor and state and private sector organizations. CareerBuilder – job search by industry, company, type, and location. Also includes links to career fairs, a newsletter, and more. monsterTRAK – for college campuses and recruiters. CareerWeb – global recruitment center with information on top technical employers, job opportunities, and applying for jobs online..
College Grad Job Hunter – entry level job site for college students and recent grads, with information on careers, resume and cover letter writing, interviewing, jobs, salaries, offers, and more. Accounting.Com – the employment page for people in accounting and finance. Career Bank – offers online job listings, resume postings, job searches, and resources for careers related to accounting and finance. CareerBuilder: Accounting Jobs – search accounting jobs by location or type, including auditor, bookkeeper, CPA, payroll, and tax accountant positions. Financialjobs.com – employment listings for finance professionals. eXtensible Business Reporting Language (XBRL) – brings the publication, exchange, and analysis of the complex financial information in corporate business reports into the dynamic and interactive realm of the internet. XBRL provides a common platform for critical business reporting processes and improves the reliability and ease of communicating financial data among users internal and external to the reporting enterprise. 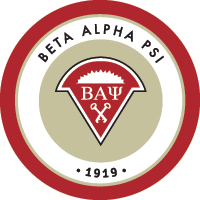 Like UAH Beta Alpha Psi on Facebook!